Ask any Indian about Mahabharata, he will tell you Pandavas were the heroes and Kauravas were the evils ones in this epic saga. That is what we have heard, seen in the Mahabharata TV serial that was aired on Doordarshan and that is what we have always believed. But, Ananda Neelakantan – the author of the book Ajaya – Roll of the Dice (the epic of the Kauravas clan) has other ideas. He in his book has switched the roles of both sides and has presented the epic Mahabharata in a new, never-thought-of light. 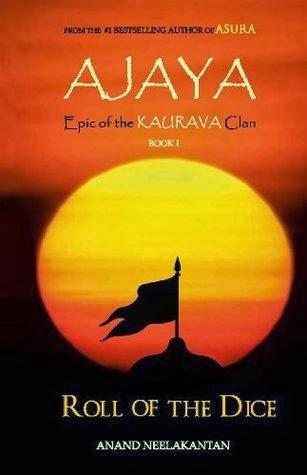 I have read Anand Neelakantan’s previous book Asura, so I thought that I had a fair idea of what to expect in this book. But, as I turned pages after pages, the author took me by surprise. I would not deny that the book intrigued me and kept me glued for all the time I was reading it. But, do mark my words of caution; the book is an epitome of radical and preposterous ideas that could even be dubbed as blasphemous by many. So, if you read it with an open mind, you will enjoy it more. If you mind what the author says about the heroes of the original Mahabharata in this book, you are likely to end up irritated. To cut the long chase short I would quote the blurb from the book which gives an idea about the premise of the book. The Mahabharata endures as the great epic of India. But, while Jaya is the story of the Pandavas, told from the perspective of the victors of Kurukshetra; Ajaya is the narrative of the ‘unconquerable’ Kauravas, who were decimated to the last man. The writing style is good. The plot seems well researched. However, there were points when I felt the author is trying too hard to portray Duryodhana in good light (He is called ‘Suyodhana’ by the author in the novel). It is not retelling of Mahabharata, rather a very different narration of the epic. I would not want to get into the details of how the story moves in the book; you have to read the book to know about it. Overall, I think the author has put his arguments and point of views about various incidents that takes place in the epic Mahabharata very deftly. That is why I was looking forward to read how he would explain the horrendous treatment to Draupadi after the Pandavas lose the game of dice. But, that is why the author stops and decides to narrate the rest of the story in the next book. After some thought, I realized he might have deliberated done so, to lure the readers into the reading the next book. I definitely want to read the next half of the book – The Rise of Kali. I received this book from Lead Start Publishing in exchange for an unbiased review. Nice post. I got this book recently and by reading your book, I think i have an idea of what to expect while reaading the book. I wonder if Ramayana was actually the way we know it? Or was Ravana the scape goat and villian because he lost?